The Holy Hierarch Calinic from Cernica Monastery was one of the great spiritual fathers of the 19th century in Romania. His importance remains about his own life like a monk dedicated to the ascetic life, as a bishop, dedicated to the life as shepherd of his sheeps and as political man, who could stand in front of the secularization politics in his times. 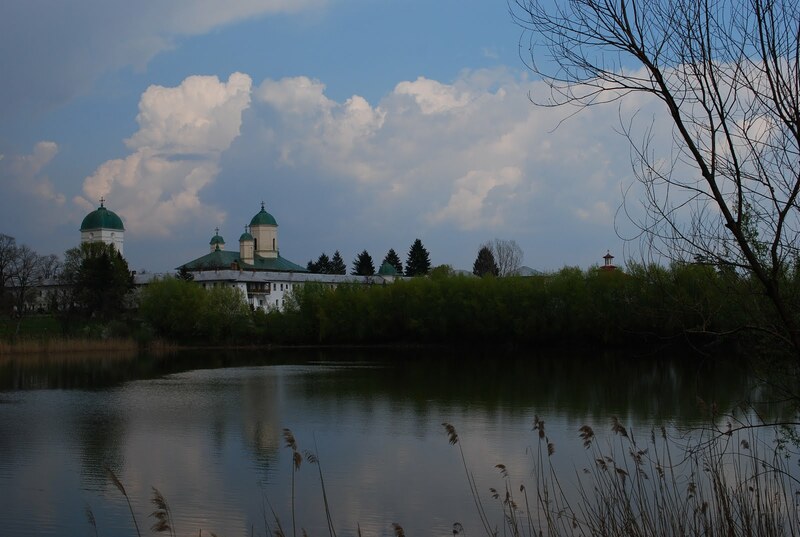 His life was described in detail by Archimandrite Athanasius Baldovin, one of his disciples, monk in the Monastery of Cernica, only a few kilometers far from Bucharest. He was born in Bucharest, on 7th October 1787, from the the noble family of the very believer Christians Anthony and Floarea (translated as: Flower; his mother became also a nun as Filothea, at her old age, at the Monastery Pasărea (=bird), near Bucharest). He had a good education in one of the schools that existed then in Bucharest, near a church, maybe at St. George church or Colţea. The atmosphere of prayer and Christian living in the family, have influenced the inner life of the young Constantine, as he was called after his baptism. Therefore, in March 1807, so before he was 20, came to Cernica Monastery near Bucharest, where he maybe have already often came to attend services and listen to the sermon of the abbot George († 1806), also a big saint and scholar of St. Paisius Velichicovski, the renewer of the monastical life in Romania, in the 18th Century, the one who brought the athmosphere from Mount Athos in the all Eastern Space. The following year, his confessor, Pimen, asked the abbot Timothy to give to the young Constantine the "angelic face of monasticism." Thus, on 12th November 1808, the young monk is named Calinic (the Romanian form for the greek Calinikos – the good victorious). After a month at St. Nicholas Church of Cernica, the Bishop Sofronie from Vratsa (Bulgarian), refugee in Bucharest because of the Turks, ordained him as hierodeacon. Guided by its spiritual father, began a life of harsh religious endeavors, with fasting, prayer, work, readings from Scripture or from the works of the Fathers and ecclesiastical writers. In 1812 he was sent to Neamt monastery together with his spiritual father, to collect aid for rebuilding St. Nicholas church, destroyed by an earthquake. In 1813, he was consecrated hieromonk by the Bishop Dionysius Lupu the future of the metropolitan of Wallachia, and after two years he was ordained and appointed confessor of his convent, than big Ecclesiarch (the responsible with the good making of the holy services). In 1817 he went to Mount Athos, where he spent nearly a year, succeeding to know closely the religious life there, and to collect teachings that will be useful in the later labors. After the death of abbot Dorotheos, at 14 December 1818, the congregation of Cernica elected Calinic in this function, in age of 31, and 2 years later he was ordained archimandrite, the biggest monastical function. He remained abbot at Cernica abbey for 32 years, where he coordinated the religious life, being a good administrator also: he built a new church, new houses for the monks and a school for the young monks. 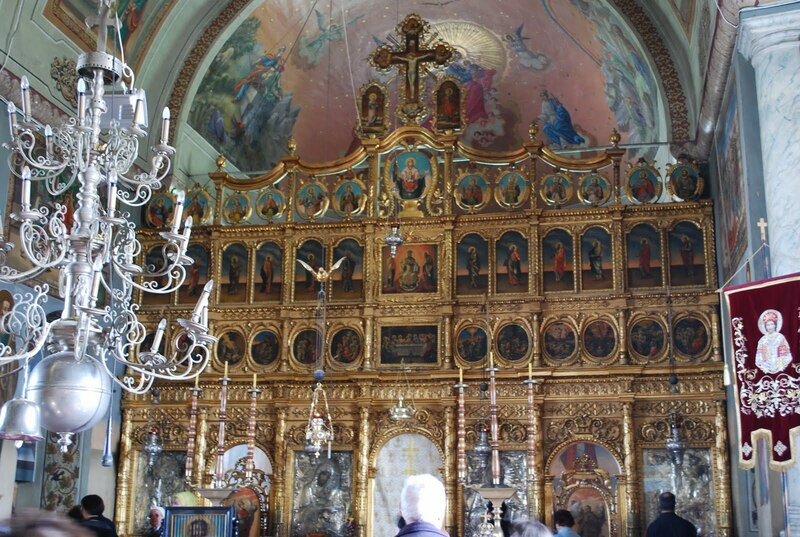 Between 1832-1836 he built the new church dedicated to Saint George at the island of the monastery. As soon destroyed by an earthquake, the abbot began rebuilding it, finishing it again in 1842. 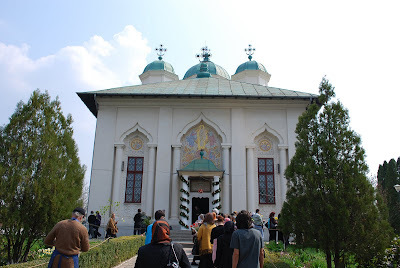 He built a new infirmary for sick monks, and in 1846 he began (with money and donations of believers) to build a new church dedicated to the Holy Trinity at Pasărea monastery, under the protection of Cernica. He established also some workshops for monastical clothes. He dealt also with copying of manuscripts, especially the writings of the Fathers, because in this times in Wallachia was no more typographies. The monastic community grows and among them came several future personalities of the church: the bishop Ioanichie Stratonichias, originally from Transylvania, the Protosingelos Naum Ramniceanu, a prominent composer, Archimandrite Veniamin Cătulescu, Professor of Religion at the College of “St. Sava” in Bucharest, Anastasius Baldovin his disciple and biographer, Nicander, his successor as abbot. St. Calinic was a good mentor also for the believers who came to the monastery. For several months in 1821, he fed a large numbers of people refugeed because of the turks, in his monastery. For the children in the village of Cernica he founded a school and paid a teacher. With the testamentary gift of a faithful, he built the church of Assumption in Câmpina, and found a school near it. 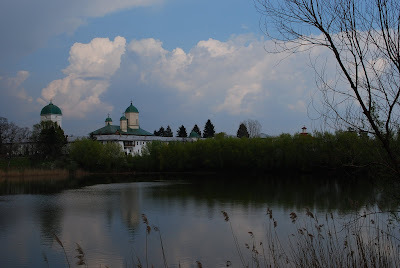 From the money of the monastery, and from his own donations, he built also some other churches in the villages around, at Bueşti Sohatu, and some others and aided other monasteries, from Poiana Mărului Ghighiu and the Icon skete of Bucharest. In 1850, after 43 years in the monastery, of which 32 years of rule of the monastic community, the abbot was summoned to the high Calinic hierarchal service. 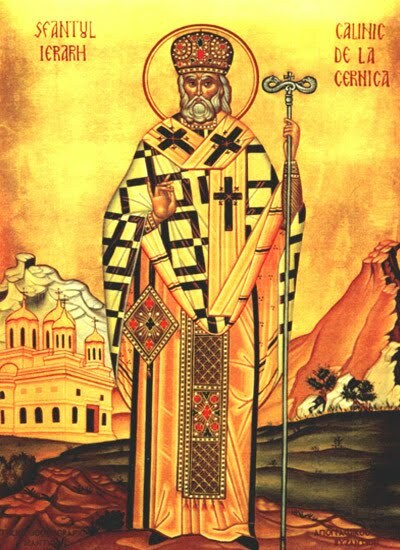 Since 1834, after the death of the st. Metropolitan of Wallachia, Gregory the Teacher, the Prince Alexandru Ghica advised him to receive the ordination as Metropolitan, but he refused, considering himself unworthy of such a high honor. In 1850, when all four bishopric seats in Wallachia were vacant, the new Prince Barbu Ştirbei persuaded him to accept the ruling of a diocese. At 14 September 1850 he was elected bishop in the ancient seat of Râmnicu-Valcea. 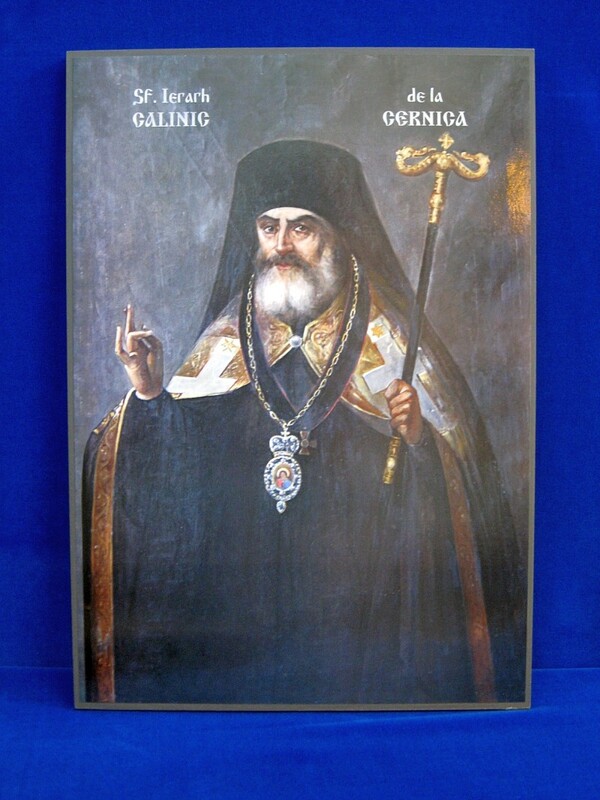 He was ordained a bishop in the metropolitan cathedral in Bucharest on 26 October 1850, at the feast of St. Demetrius. Called to this high service, the new bishop found the diocese in a difficult legacy faces. For 10 years the it had only deputies, the bishop's residence and cathedral were destroyed by a fire, the number of priests was insufficient, poorly prepared and the seminary was closed after the Revolution of 1848, such as also some places of worship. The new bishop to visit the diocese and ordained new priests. In 1851 opened the seminary in Craiova, then in 1854 moved it back to Ramnic, and he opened some schools to prepare church singers. In 1854, after moving to Ramnic residence, he began raising a new Episcopal cathedral and rebuilt inside the Episcopal residence an infirmary. 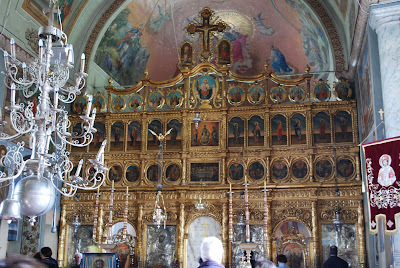 Between the years 1859-1864 has raised from his money from a new church in hermitage Frasinei. He introduced here the harsh rules of living from Mount Athos, which he himself respected as he entered in the monastery. In his years, the first prince of the reunited Romania, Alexandru Ioan Cuza proceded to the secularization of the church’s properties. Almost 25 % of the whole surface of the country was in the property of different dioceses and monasteries, mostly subordinated to some other “mother-monasteries” in Greece or Palestine. So, the measure of Cuza was good, taking back in the property of the Romanian state a big territory and giving after to more than 1.000.000 peasants. But, Cuza made also bad things. He restricted the possibility of entering in the monasteries, he closed some churches and seminaries, and ordained that the election of the new bishops to be approved officially by himself, establishing in this way a kind of caesaro-papism. In this harsh times, Calinc was the only bishop remained as titular. He intervened to Cuza, to save the monastery fromsecularization. The prince responded positively to his request, and the hermitage is the only one left with all the goods it had before. The Bishop was also an animated patriot. As an hierarch, he took part in public work of the Assembly of the country, then was elected deputy in the new parliament of the united Romanian. He was also part of the country elective Assembly which elected the first ruler, Alexandru Ioan Cuza. Since the spring of 1857 he sent a circular to the Deans and superiors, demanding that all churches to make prayers “for the union of the Romanians in one will and conscience”. Especially we must search about his particular life as a life of sanctity. Everyone who knew him were impressed by his many charity, the simplicity of dress, his kindness and gentleness, his healer prayers, his fastings and vigils. Athanasius Baldovin, his biographer, wrote that Calinic had a list of people who helped. Always when he ordained priests, he gave them books and even money for the trip. “He was so gracious that if he didn’t have to give something, he gave his own clothes and, weeping, prayed me the unworthy to look for money wherever I know, that he may have to giveto his brothers in Christ, because so called the poor and powerless”. Contemporary witnesses recount several cases of the disease healed by prayers of St. Calinic, such as was a young daughter of a worker from Muiereasca, who worked then at the construction of the Episcopal cathedral in Râmnic. The life full of restraint he had (he never ate meat, he was resting only on a wooden chair), and the old age, urged him to write his will. Among other things, he wrote that he leaves no money for his own burial or memorial, because everything he had, he split to the poor and offered to restore buildings. Old and sick, he retired at Cernica Monastery in 1867. Since then the government refused his withdrawal from the seat, he remained officially bishop until the end of life, sending the Archimandrite Gregory from Cernica to rule the affairs of the Diocese. He lived almost a year as a simple monk, until 11th April 1868, when God called him to Himself. 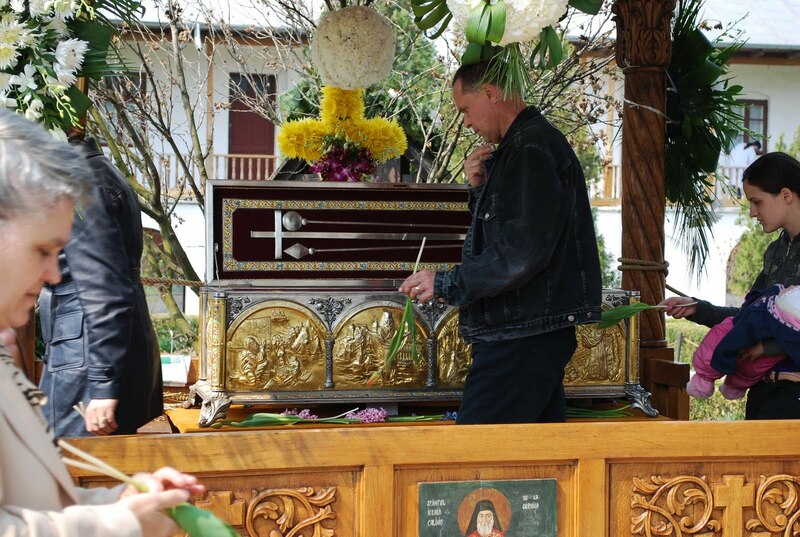 He was buried in the church of St. George, his foundation. His holy life, demonstated by his acts, but also by the faith of the believers in Wallachia, made the Holy Synod of our Church to decide, on 28 February 1950, to put bishop Calinic among the saints. His solemn canonization was made at Cernica Convent on 23 October 1955, in the middle years of harsh communism, in the presence of many Romanian and foreign bishops, of many monks, priests and faithful. 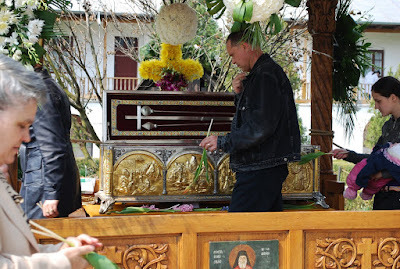 The relics have been placed to honor and worship in the church of St. George. Thus, the humble abbot and bishop Calinic became one of the greatest saints of the Romanian Orthodox calendar. His feast day is on 11 April. His image is portrayed in many parish churches and monasteries, and his name is held by many believers who enter into the monasteries as monks. “Your light-bearee memory, Hierarch Calinic, gladdens the hearts of believers and the reach the holy shrine of your holy relics, sanctifies the feelings and gives healing; for this, as debt, we honor you and sing your joy: Hail, Holy Hierarch Calinic, the wise of God!” (The Holy Akathist of St. Calinic, Kontakion 1).